Is it just me, or does that giant '73 front bumper stick out too far and make the car look like it has no chin? I had a fiberglass '73 bumper around (oh, yeah, the factory bumper also weighs too much) so I've lowered it about 5 inches and moved it back so it's about even with the front of the hood. It lines up perfectly with the valance, and the stock chin spoiler fits right on like it was designed that way. I have some ideas about how to fill in my enlarged grill area. I did not know you could get a fiberglass replacement, are they still available? 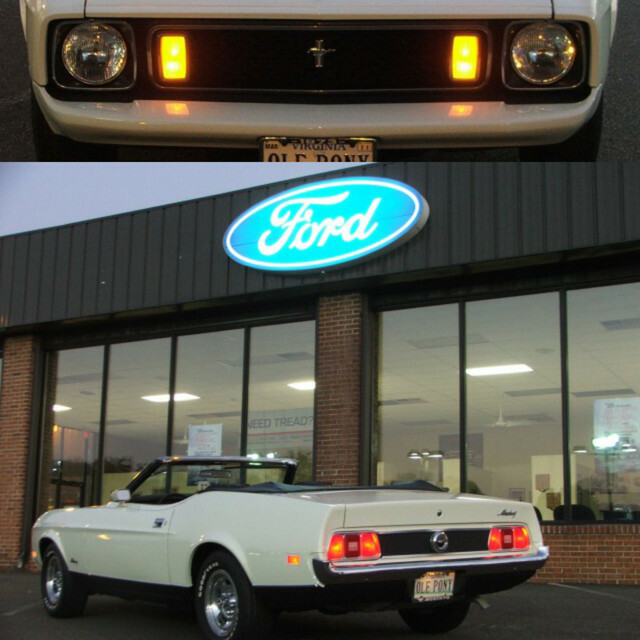 The 73 is the longest Mustang ever built, including the new models, because of the 5 MPH bumper laws that were enacted that year. The back bumper also sticks out further than the 71/72's. I picked it up a few years ago . . . I think it was from Crites Restoration, or Showcars Bodyparts. Neither web site shows fiberglass bumpers for Mustangs anymore, so I'm glad I got this one; otherwise I'd be making a mold and doing it myself. I have a couple of spares I could fool with. I have the '71/2 brackets to pull the rear bumper in, and have removed that little metal filler strip they added between the body & the bumper. I'm all about taking off excess weight where I can. It is also possible to retro-fit a 71-72 chrome bumper on a 73. A guy on VMF did it and it looked pretty good.